IOGraphic tracks and then visualizes your mouse activity on screen. When designing websites today, designing a site that is easy to navigate is just as, if not more important than designing a site that entices the viewer to immerse themselves further into the page. But just how does one go about figuring out the right path to take which culminates in a successful user interface? For starters, there are many “heat map” applications available for user interface research. Essentially, the purpose of these apps is to gauge just what is it in a website that visitors find interesting – what part, or parts of the screen are they drawn to? These maps are visual records of the mouse clicks and cursor trails of website visitors you can use to understand how people explore your webpage. An addition to the list is a fun, interesting application called IOGraph (formerly MousePath), created by Moscow designer Anatoly Zenkov. Using the application is very simple: run the app, press record, minimize the window and go about your daily routine. Open up IOGraph anytime after it’s launch and pause the app to view a map of your on-screen activity. 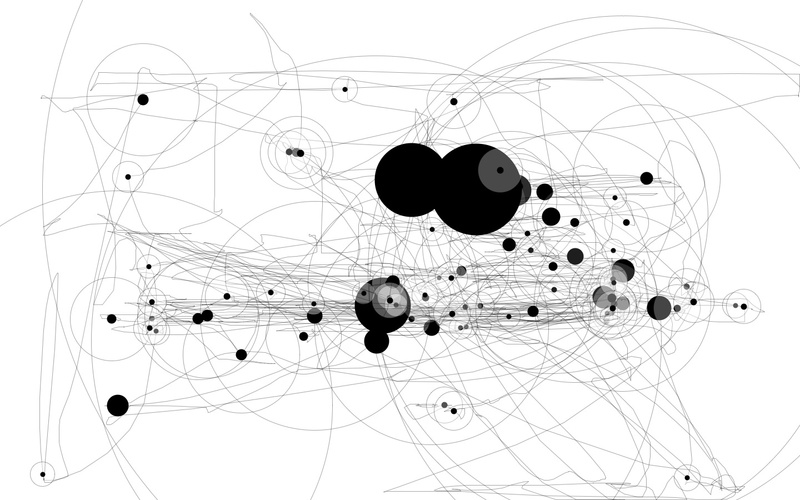 You’ll find the visual representation is very similar to a Pollock painting or a Steadman-esque line drawing: tracks of your mouse path, circles where your cursor pointer lingered and stopping points where you may have been using your keyboard or otherwise immersed in content are all represented. While the site heralds IOGraph as “an application that turns mouse movements into modern art”, web developers and designers alike will see the additional benefits and uses for this application right away: a free testing tool for honing a site’s UI. IOGraph is available for both the Mac & PC and is free for download at http://iographica.com/.